Avantasia albums typically take me a long time to digest. There’s always going to be a couple of track that clock in about 7 minutes+ and sometimes I have the attention span of a gnat. Hey, what can I say? I don’t have the time nor inclination to listen to many albums that are 70 minutes long. But, once I do settle in and pay attention to whatever Tobias Sammet has cooked up, it’s usually proves worth of my concentration. As we’ve come to expect from Avantasia releases, Ghostlights is an assemblage of all-star vocal talents for Tobias to share the microphone. Of course, it wouldn’t be a new Avantasia album without appearances by Jorn Lande and Michael Kiske but we also get Dee Snider, Geoff Tate, Warrant’s Robert Mason, along with Magnum’s Bob Catley and Pretty Maids vocalist Ronnie Atkins. Bruce Kulick shows up again to contribute some guitar work as well (this is the fourth Avantasia album he’s lent his talents to). Like all Avantasia releases, there is a story going on. Ghostlights serves as a sequel to 2013’s The Mystery of Time, but honestly, I couldn’t care less about the story or the concept of the album. What I want are great vocals, amazing choruses, loud guitars and powerfully epic ballads and that’s exactly what Ghostlights delivers. My absolute favorite tracking is “Isle of Evermore”. It’s a haunting Gothic ballad that features Sharon den Adel (from Within Temptation) on vocals. Another highlight is hearing Tobias sharing vocal duties with Twisted Sister’s Dee Snider on “The Haunting”. 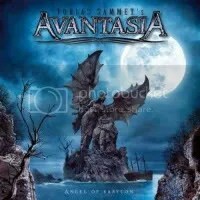 This is another worthy addition to the Avantasia catalog! Fun fact: Meat Loaf was the intended singer for “Mystery of the Blood Red Rose”, but pulled out for unknown reasons. Instead, it’s the only track on album where it’s only Tobias on vocals. Tobias Sammet just does not quit! Between Edguy and Avantasia, he’s constantly recording or touring. He’s the German equivalent of Dave Grohl. Busy, busy, busy! It seems to be paying off. The Mystery of Time has done very well across Europe and while it didn’t break the Billboard 200 in the United States, it sold well enough in its first week to make Billboard’s Heatseeker and Hard Rock charts. Thankfully, The Mystery of Time is only a 10-track collection and not a double album effort like when Sammet released The Wicked Symphony and Angel of Babylon simultaneously back in 2010. But don’t worry, there’s enough power metal epics here — “The Great Mystery” and “Savior in the Clockwork” both clock in (no pun intended) at 10 minutes. Though I included this album in my Top 10 list for 2013, I didn’t get around to really listening to it until the end of the year even though it was released in March of 2013. Boy, I’m sorry I procrastinated. 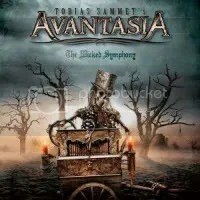 This may be my favorite Avantasia release yet and the presence of the German Film Orchestra Babelsberg only adds to the majestic metal that Avantasia already brings to the table. Speaking of that orchestra, Edguy used them for their Hellfire Club album. I admit it’s getting harder to tell the difference between Edguy and Avantasia these days. Sammet is the driving force in both bands and they both play power metal. The only real difference is that Edguy seems to have a cheesy sense of humor and Avantasia uses a lot of guest vocalists. Yeah, definitely should have rated this one higher for 2013. The more I listen to it, the more I like it. Great vocal performances all around, great melodies and songs that you can’t get out of your head. 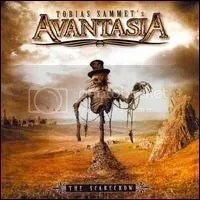 Best Avantasia album yet. An epic collection featuring two epic albums! 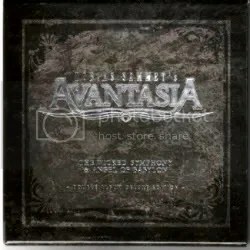 This deluxe edition collects both of Avantasia’s 2010 releases plus features a fairly lengthy booklet full of pictures and notes on the making of the albums. This time, instead of pure laziness, I actually had a good reason for not reviewing this set when I initially planned… it was just too much to absorb at once! For some strange reason, unlike The Wicked Symphony, Angel of Babylon has not been released as a single disc in the United States although it is available as an import. I bought this collection on Amazon shortly after the street date because it turned out it was cheaper than having to order both albums separately because Angel of Babylon‘s import price was ridiculous at the time. This collection itself is actually an import (some of the text of my particular copy’s cellophane wrap was in Spanish) and it was retailing for $60-70 at most online shops when I first looked. YIKES!!! There are some very good deals to be found for it in Amazon’s Marketplace though, that’s how I got my copy and only paid$27 for it. The very first thing I think of when I think of Avantasia are the amazing vocals that are always involved. Of course there’s Tobias Sammet, who is one of my favorite metal vocalists but Jorn Lande, Michael Kiske and Russell Allen shine on both albums just as they did on The Scarecrow. Jorn is featured on so many of these songs he might as well be considered a full-time member of Avantasia alongside Tobias. A Sammet/Lande album, anyone? And that’s not all! Klaus Meine, Tim “Ripper” Owens and Jon Oliva make appearances as well. To this day I still have not heard the first two Avantasia albums. Some have complained that Tobias has taken the music in a slightly different direction, which is his prerogative since Avantasia is a side-project and a labor of love after all. Actually… Now that I think about it, if anything, I think Avantasia has become a bigger focus for Tobias than Edguy has been lately. Even so, the line has been blurred and both groups are becoming a bit interchangeable in sound. Not that I’m complaining, I like the direction both bands are headed in: great melodies, huge fantastic vocals, big drums, a bit of pop music, some ’80s hard rock, catchy choruses. Not many can do melodic power metal better than this. I leaned towards The Wicked Symphony when I first bought this collection but after giving both albums many spins, I think I like Angel of Babylon better. There’s really no filler on that album at all. Either way, both are better than The Scarecrow (which I liked) and are two of 2010’s better albums! I just got into Edguy about 2 years ago. I was looking for CDs at FYE and stumbled across Rocket Ride. A sticker on the cover said something like “for fans of Scorpions, Judas Priest, and KISS”. It was only $10 or so, so I picked it up. I loved it, I went and bought more Edguy and loved those albums too. So here I am now, a loyal follower of Edguy frontman Tobias Sammet, so I picked up his latest solo project’s offering. Avantasia, for all intents and purposes, is basically Sammet himself writing the songs and then bringing in friends to play and share vocals on it. This is the third Avantasia release, I’ve only head bits and pieces of the first two (The Metal Opera and The Metal Opera Part II) but I’ve never gotten around to getting them. Anyway, I heard “Lost in Space” and “Carry Me Over” online and that was enough to make me want this album. A lot of fans are claiming Sammet “sold out” with his look and a few songs here (most notably the two I mentioned), the’re saying he’s trying to be the next Bon Jovi. Tobias has addressed these complaints and dismissed them. What’s wrong with writing catchy rock/pop songs? It’s not like there’s not enough metal to go around on the rest of the album. I knew upon a second listening to this album when it was originally release that it was already going to be one the year’s best, despite that fact that it was released in January. You simply have to hear “The Scarecrow” is one of the most epic and awesome songs ever, seriously, I think it’s one of the greatest songs EVER. It gives me chills, especially Jorn Lande’s vocals. Amazing job. Sammet has become one of my favorite vocalists as well. I was listening to an early Edguy album a few weeks ago and he’s really grown as a singer. Soaring vocals, man! Guest appearances abound! Just to name a few: Rudolf Schenker, Kai Hansen, Michael Kiske, Jorn Lande, and Alice Cooper.